36' Steel Truck Loading Yard Ramps 20,000 Lbs. Capacity allow you to quickly load and unload trucks, trailers and rail cars from ground level when no freight dock exists. Increase productivity while reducing material handling costs. Great for construction sites. A double-acting hydraulic pump, mounted internally for protection from damage, allows for smooth and quick raising of the front lip to proper trailer height. 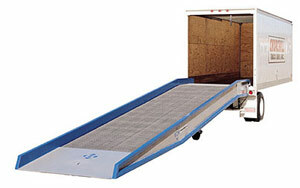 The 36' overall length includes a 30 foot of straight ramp and 6 foot level off. Also included are 18" solid rubber tires for easy positioning and towing, serrated steel grating provides excellent traction, steel safety curbs, safety chains hold Yard ramp securely to the trailer and welded steel construction (painted blue). See table below for specs. Available in 70" and 84" widths. 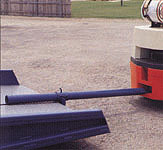 Other options available are rampclamp, towbar, pneumatic wheels (2) and galvanized (call for pricing).